Former Leafs GM Brian Burke was fired earlier this year, but his decisions laid the groundwork for this season's success. Photo by bigdaddyhame, from the Torontoist Flickr Pool. Many of us have felt it coming for a few weeks, but now it’s finally official. After a game against the Ottawa Senators on Saturday, the Toronto Maple Leafs clinched their first playoff berth in nearly a decade. It’s been a long, long time since this city has seen playoff hockey. Ours is the only team in the NHL not to have made it to the postseason since the 2004-2005 lockout. Toronto fans have had a tough time these past several years. Single-player roster moves and staff or management changes were too often touted as silver bullets that would somehow lead the team to salvation. For instance, now-former general manager Brian Burke arrived in 2008 with much fanfare. The media considered him to be the saviour of the Maple Leafs (he was certainly, at any rate, being paid a saviour’s salary). Sure enough, Burke landed some big names in his first year as GM. It practically made us forget that he was inheriting arguably the worst NHL team in the league. No reasonable person should have expected major success from the Maple Leafs in the first few years of Burke’s tenure. It takes time to build up an NHL team from worse-than-nothing to a perennial playoff contender. 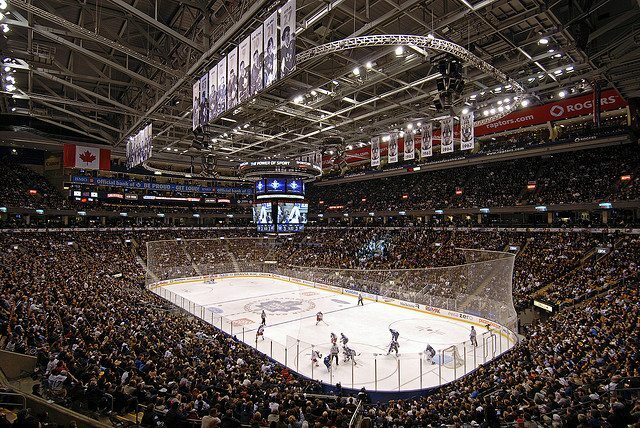 Even so, both fans and sports writers became increasingly impatient with the Leafs’ failures year after year. Then, before this year’s lockout ended, Burke was shown the door, leaving assistant GM Dave Nonis at the helm. Here’s how Burke, despite being fired for his efforts, managed to build a winning team. It has been a popular assumption that any teams using the old rough-and-tumble approach won’t be able to keep up as the game gets faster and officials continue to tighten up on obstruction-type calls. What’s particularly fascinating about the success of the Toronto Maple Leafs this year is that it proves that the bellicose Burke model is a viable strategy in the NHL of today. The Toronto Maple Leafs are the only team currently averaging more than one fight per game. Toronto is also the only team in the NHL with more than one player among the top ten hitters this season. One of those brawlers is Burke’s addition: Leo Komarov (signed from Moscow Dynamo of the KHL), who will likely end up with around 175 hits before the end of the season. Frazer McLaren, acquired from Anaheim by Nonis, will probably end up with something like 155 hits. Burke’s imprint on this Leafs team goes beyond toughness. The players he believed in and went after throughout his tenure as GM now not only lead the team in scoring, but are among the league leaders in points this year. Burke’s trades for forwards Phil Kessel, Joffrey Lupul, and James van Riemsdyk have absolutely panned out. Though Lupul missed the majority of the season because of an injury, all three of these Burke acquisitions are making huge impacts on the scoreboard. In fact, Kessel is currently one of the top ten point producers in the league. The Leafs are even getting it done from the point. Cody Franson (acquired by Burke from Nashville in 2011) and Dion Phaneuf (from Calgary in 2010) are tied for fifth in the league for points by a defenceman, with 27 each. And there’s no way we can leave Nazem Kadri out of this discussion. Burke selected Kadri 7th overall in the 2009 entry draft. Kadri was nowhere near ready for NHL action in his first few rookie years. Now, with nearly a point per game to his credit and one of the best plus-minus ratings on the team, there should be no doubt in anyone’s mind that he’s ready for prime time. As a quick aside, only because people keep comparing Kessel and Tyler Seguin (who the Leafs could have had if Burke hadn’t traded first-round draft picks for Kessel in 2009): Four of Burke’s additions to the Leafs—Kessel, Kadri, van Riemsdyk, and Lupul—are putting up more points per game than Seguin this season. Remember when every Toronto media outlet was talking about how the Leafs desperately needed an elite goaltender and should go after Roberto Luongo? Thank god that didn’t happen, right? The 60/40 workload split between James Reimer and Ben Scrivens, both Burke-era additions, has resulted in some solid goaltending numbers throughout the season. Perhaps the yin to the pugilist yang for the Leafs is the team’s impressively effective penalty killing this season. It’s the third-most effective in the league, as a matter of fact. That’s a huge improvement over the past three seasons, during which the Leafs were always either at the bottom of the league or close to it. While Toronto is actually in the middle of the pack in terms of how many times it has been shorthanded throughout the season, The Leafs’ penalty-kill effectiveness has been a major component of their success so far. No matter what happens to the Toronto Maple Leafs in the postseason and the off-season, this year should be seen as a success. We should keep our expectations in check and remember that it takes time to build a successful hockey franchise. For the first time in a long time, the Leafs have a rather healthy depth of talent. Regardless of how the playoffs unfold for the team, its managers would be wise to keep from messing with the first winning formula they’ve had in a long time. Though we wouldn’t bet on the Leafs making the Stanley cup finals, maybe they’ll prove us wrong and give us even more to cheer about. Until then, we’re more than happy to celebrate the return of playoff hockey to Toronto. CORRECTION: April 24, 2013, 1:40 PM This post originally said that Frazer McLaren was acquired for the Toronto Maple Leafs by former general manager Brian Burke. In fact, McLaren was added to the team by Burke’s replacement, Dave Nonis.